Disc Golf | Millennium Games | Over 1,000 Games! Disc Golf Store in Western NY. 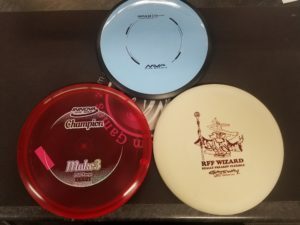 Our Disc Golf section contains over 4,500 discs with 10 unique brands. Disc golf is a outdoor activity in which one player throws discs (like Frisbees) with the goal of landing the disc in a metal target. The target is an elevated basket, with the metal pole raised above the basket and connected with chains. The chains are used to slow down the disc in flight, helping it to land in the basket. Each throw counts and 1 point, and the goal is throw the discs from a starting pad to finish in the basket in the least amount of throws. Each combination of starting pad and basket is called a hole, and a full game, known as a round, will consist of 18 unique holes. Half rounds are also played with 9 holes, and there are also areas for practicing shots. The sport of disc golf is one of the most cost-efficient ways to enjoy the outdoors and get exercise for any lifestyle or activity level. People who are not physically active right now can use it to get into shape without the monotony of a gym or treadmill. Some of the more difficult courses will have changes in elevation, water, or trees to block the hole, which also provide additional exercise in the form of hiking and cross country conditions. Competitive players will look to lower their score each time out, and compare their results with friends and family to show who is best, and after much practice players can participate in coordinated events – the Rochester area hosts up to 6 large tournaments each year, and there are weekly leagues for both singles and team play. The community of disc golf is a huge group of friendly and helpful players who are always willing to give advice or directions to new players, and regularly meet to form new friendships. Innova features the Blizzard and Star Lite Plastic – Lighter discs to help new players. Why choose Millennium Games for my Disc Golf Needs? At Millennium Games, we specialize in disc golf – Every employee has played at least once, and over 75% of us play weekly. Millennium Games stocks over 4,500 discs at any time, and will take customer orders for discs. We also have a variety of disc golf carrying bags, towels, practice baskets, carts, and other accessories. Most other stores will have a few hundred discs and very few accessories. 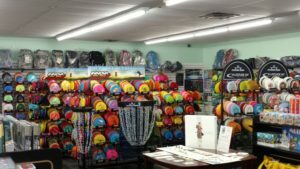 Millennium Games carries the top 10 disc golf brands in the industry, and our inventory on each brand is larger than mosts stores ENTIRE inventory. 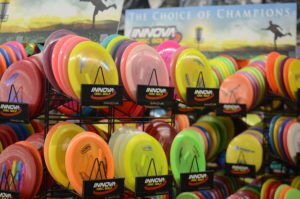 – We specialize in Innova, Discraft, Prodigy, Westside, Dynamic, and Latitude ’64. Discmania, Gateway, MVP, Axiom, round out outrand more. We also have used discs for up to 70% less than retail price. Ellison Park – 200 Landing Rd N, Rochester, NY 14625 – Built into the sloping valley off of Blossom Road, this course features many open areas, is forgiving to errant throws, and has very limited places where discs can be lost. Most of the obstacles are either large oak trees, or the changing elevation. New players will enjoy throwing the disc down the large hills and seeing how far they can go. It is also the most populated course, so new players will have the chance to interact with the community. Churchville Disc Golf Course– 120 North Main Street, Churchville, NY 14428 – Just north of the town of Churchville, this course features a wide open space for the first 9 holes, then adds a medium amount of trees to increase the difficulty on the last 9 holes. There is very little elevation change, and players will learn how the wind will effect their throws. The Driver will be your disc for distance, allowing to to cover the most ground with one shot. They are the hardest to keep straight, so use it when you have open spaces to land. You want the extra space so if you miss your mark by a few feet, you will still have an open shot. will stay very straight, so if you throw it at a steep angle around the obstacle, it will come back towards the middle. The Putt/Approach disc will be what you use for your final shot. It is meant to be thrown very flat and to absorb energy when it hits the chains of the basket, so it does not fall out the back of the hole. Putt/approach discs have the largest amount of modifications, with some having grooves cut into the disc to provide better grip for your thumb, finger, or both. They also have a variety of stiffness, with some very rigid and others as flexible as a pancake. Choosing the correct Putting Disc for you is more about feel and comfort than anything – If you are not confidant that you can make the shot with the disc in your hand, you are more likely to miss. Make sure the disc feels comfortable and has enough grip so you can make a strong shot at the basket. As always, the staff at Millennium Games are always ready to help you with your disc golf needs. We can help you whether you just started to throw, or are looking to lower your score for an upcoming tournament. Our excellent staff can provide you with the knowledge and advice that will get you back on the course and playing better! Give us a call at 585-427-2190 and we can offer advice, check our stock to reserve a disc for you, or order something that may not be in stock free of charge.